The Regional Office Gulf States of the Konrad-Adenauer-Stiftung and CARPO are jointly organizing the conference ‘Addressing Security Sector Reform in Yemen. Challenges and Opportunities for Intervention during and post-Conflict’ from April 03-05 2017 at the Dead Sea in Jordan. The aim of this conference is to bring together distinguished experts and practitioners from Yemen and the region as well as from Europe and the United States in order to discuss lessons learned from previous attempts at SSR in Yemen and to identify and develop practical policy options for constructive interventions during and post-conflict that aim to contribute to the stabilization of the country. The papers, which will include clear policy recommendations, will be jointly published by the project partners in a policy report. This report is the result of a conference with the same name, which was jointly organized by CARPO and the Regional Office Gulf States of the Konrad-Adenauer-Stiftung (KAS) at the Dead Sea in April 2017. 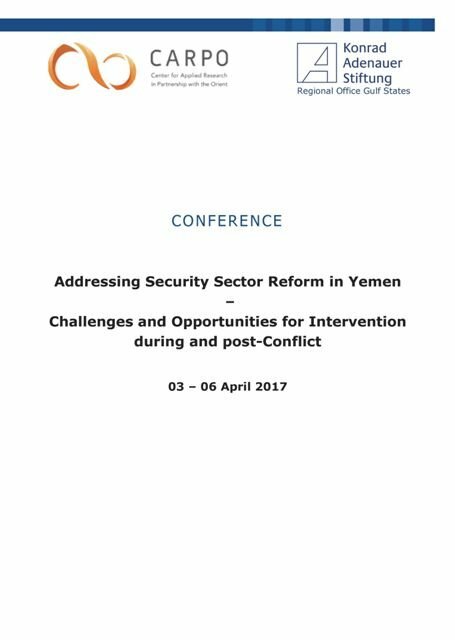 The papers by prolific experts on Yemen included in this publication discuss the changes, obstacles and limits for successful security sector reform in Yemen during and after the conflict and offer respective recommendations for national and international policy-makers in the field.